Usually our Hurricane season doesn’t officially start until June 1 of every year and runs to November 30, and usually nothing ever happens until AUGUST — but not this year. 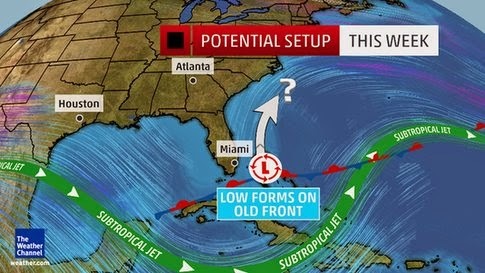 We already have a mysterious LOW in the Atlantic that could prove to be our first storm of what is supposed to be a “slow” season. Maybe not! It does not look like a problem for the Gulf of Mexico at the moment but the fact that we are seeing low pressure in the Atlantic a month before the official beginning of hurricane season is a reason to be cautious and get prepared for a possible storm that no one expected. It’s been 7 years since Hurricane IKE hit Houston – so we can’t stay “lucky” indefinitely. My gut says that when they say it will be a “slow” season is to expect the unexpected! Hurricanes throw wind-borne debris through glass windows, allowing uplift on the roof that destroys a building. Armor Glass security film is designed to avoid a breach by large debris strikes (up to 4.5 lb), saving the interior from wind, rain, mold, flying glass and dangerous uplift. Get more info from our Free EBook “Houses of Straw” at our website. Recently we have been called by storefronts that have been broken into multiple times. We put security film on 8 stores for a well known regional restaurant chain and it has already prevented injuries when a motorcycle collided with a store and broke a window. It kept glass from spraying onto customers. We have been taking care of homeowners with solar heat and security issues. We have put it on homes, churches, schools and private and public buildings. Retired teachers have it, along with astronauts and engineers. Some of our clients are literally “out of this world” at the moment. It costs nothing to get a quote.